I recently was browsing at our local used CD/book store and came across an excellent CD. It was the compact disc version of the Brook Benton and Dinah Washington collaborative album called "The Two Of Us". 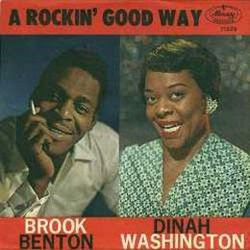 The dislike that Brook Benton and Dinah Washington had for each other is now remembered more than the album, so I had to do some research on this interesting pairing. 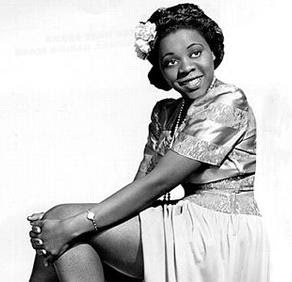 In February 1959, Dinah Washington recorded one of the biggest jazz-pop crossover hits by a female jazz vocalist to date. Backed by shimmering strings, a small choir and a rhythm section, Dinah leaned into the studio microphone and sang What a Difference a Day Makes for Mercury Records. Produced by Clyde Otis, the easy-listening, bluesy ballad was meant to be just another moody jazz vocal track. But in 1959, with Elvis Presley in the army and a vacuum in the rock world created by the sudden death of Buddy Holly in February, pop began to make a mini comeback with young audiences. Within weeks of its release in the spring, the height of prom season, What a Difference a Day Makes entered Billboard's Hot 100 chart in May and soared to #8. The song would remain on the chart for 20 weeks and transform Dinah almost overnight from a jazz-blues singer to a jukebox pop star. But the song's success also inflated Dinah's diva side. After laboring for years under enormous pressure, cranking out jazz and blues hits, Dinah by early 1959 had still not achieved as much recognition or pay as Nat King Cole, Ella Fitzgerald and other better-known jazz singers. With What a Difference a Day Makes, Dinah viewed her 1959 hit as belated confirmation of her ability to kill in the pop market and become a bankable mainstream star. 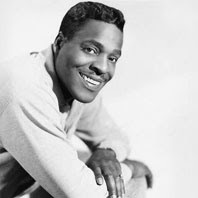 Brook Benton was another hot property at Mercury Records in early 1959. The smooth-voiced r&b baritone had recently recorded It's Just a Matter of Time, which entered the Hot 100 chart in January and rocketed to No. 3. Benton followed the single with Endlessly, which hit the chart in April and climbed to No. 12. Both songs were written by Benton and Clyde Otis. Benton's magic touch gave Otis an idea. He called Dinah and told her he wanted to pair the two of them for a single. For producer Otis, the single had a shot at becoming a hit on virtually every chart. But Dinah was suspect. She was a star now, a singer who had paid her dues since the mid-1940s. If she was going to be lined up with another singer on a recording date, she didn't understand why someone of her stature should have to work with a relatively green Benton. Dinah also didn't see how exactly the union could help her career. After all, Benton's reputation could only be elevated by his association with Dinah. By contrast, how could her link to him make her any more popular than she already was? Clyde Otis' response to Dinah was that Benton's masculine, relaxed sound would give her a sexier image and further extend her appeal with younger audiences who listened less and less to jazz and pure blues. When Dinah entered Mercury's studio in late 1959, she was apprehensive and concerned about being out-gunned by Benton. Benton, who had the looks, voice and hits behind him, arrived as a go-getter who had the world by the tail. Dinah thought Benton was out of her league. Benton felt she was a bit over the hill. Unfortunately for Benton, he was a little too cavalier, either because he was nervous appearing with Dinah or woefully unprepared. When the red light went on, the orchestra's strings played a skippy downbeat and intro to Baby (You Got What It Takes), with the guitar, bass and drums coming in with a rock boogie beat. Benton took the first chorus, with Dinah following. But instead of playing it straight, Benton started to showboat, ad-libbing soulful "Oh, yeahs" around Dinah's vocal. You can hear the tension build until finally, at 2:03 into the song, Benton made a fatal mistake. He got carried away and accidentally sang the first words of Dinah's part. At that moment, they vocally collided, with both singing the word "because." Dinah opened up with both barrels. As the song winds down, we hear Dinah taunt, "You're back in my spot again, honey." Hoping to go with the flow, Benton replies cockily, "I like that spot." Over the remaining 40 seconds, you hear Benton push back and Dinah going all out. 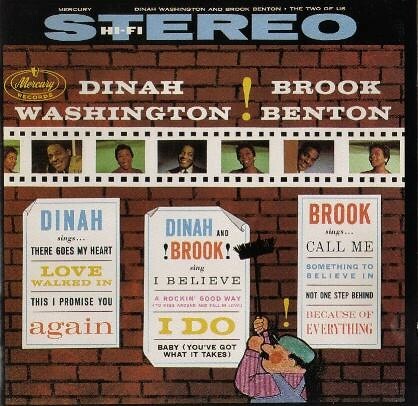 As the song starts to fade, Dinah lectures Benton: "Don't say it again" and "One more time, Brook." It's unclear how many takes were made of Baby. We do know that the B-side, I Do, a slow-dance ballad, was recorded next and went off without a hitch. Fairly tame, its wedding-day theme worked beautifully for both singers and was sure to fuel rumors that Dinah and Benton were an item. Publicly, Benton laughed off Dinah's snappishness. "She could be difficult," he said, but insisted they got along "very well in the studio...The goof wasn't intentional," he went on. "We were playing around really, you know, testing as we went along. Frankly, some of the time we didn't even know they were taping. We were like having a dry run." Whether the sniping was real or not, the flawed song was released in January 1960. The single was an immediate success, reaching No. 5 on Billboard's Hot 100 chart. For chart purposes, Mercury had to change the song's name to Baby, since United Artists had just released a record by Marv Johnson called You Got What It Takes, a completely different song. By Easter of 1960, Dinah and Benton were booked into the Brooklyn Paramount Theater for a 10-day show. They clicked so well that many observers thought they might be having an affair. "[Dinah] had no respect for him, no respect for him personally. She kept saying, 'You're a dumb so and so'...and he didn't like having her chastise him. According to Shelby Singleton, another Mercury executive, Dinah told Benton she was 'tired of making you a star' and didn't want to make any more records with him." Otis halted the session after they recorded the B-side and sent Dinah home. He had Benton then record the remaining tracks they had planned to do together. While you hear the carping on the track, I believe it was staged to recapture the hit-making bickering of the first single. Aside from Benton's ad-libbing, which had to have been pre-arranged, there really isn't much error or misfire and little reason for Dinah to be upset. My guess is that Otis called for Dinah to complain toward the fade out, and Dinah viewed this as a cheap, gimmicky trick for someone of her stature and that she walked as a result of Otis, not Benton. In early May, Mercury released A Rockin' Good Way backed by the I Do-like ballad I Believe, the only single from the planned duet LP. A Rockin' Good Way actually was a cover of a Priscilla Bowman hit and had a pecking rock beat similar to Baby (You've Got What I Takes). After the song hit, Mercury released a more traditional solo album by Dinah called Unforgettable to mixed reviews. But Dinah's new image and success as a jazz crooner, pop-rock vocalist and early rock star was already established. Unfortunately, Dinah and Benton would never record again. Dinah died in December 1963. As for Benton, he recorded a string of unforgettable r&b songs. Finally in 1970, he had a hit with Rainy Night in Georgia, which reached No. 4. Benton died in 1988.